Step 1: Your Personal Financial Statements, which gives a clear picture of your personal balance sheet is evaluated and a realistic Financial Plan is drawn to help meet your future Financial Goals. This draws several assumptions with respect to your income, inflation, your time horizon, taxes, expenses relating to education, purchase of a dream home, retirement goals and even assumes provisions for unexpected needs. Step 2: Investor Profiling is done in view of both Situational Profiling which places the Client into categories according to stage of life or economic circumstances and Psychological Profiling that respects the Client’s attitude and perception towards risk and return. Step 3: Investment Outlook ocuses on capital market expectations of various asset classes both in the short run and the long run. The current global economic scenario along with forecasts of several variables is of significance here. Step 4: Investment Universe- We survey a vast expanse of global investment opportunities in the capital markets that might be suitable in helping build a suitable portfolio for the client. Step 6: Formulating the Client’s customized Investment Policy Statement (IPS) is an extremely crucial step. This takes into account the Client’s return requirements, risk tolerance, time horizon /s, any liquidity needs, tax considerations, legal issues and any unique circumstances that would have an impact in managing the portfolio. When assessing the Client’s risk tolerance, the Portfolio Manager not only considers the Client’s ability but also his / her willing to take the risk. The IPS is used as guideline that is strictly adhered to in managing the Client’s portfolio. 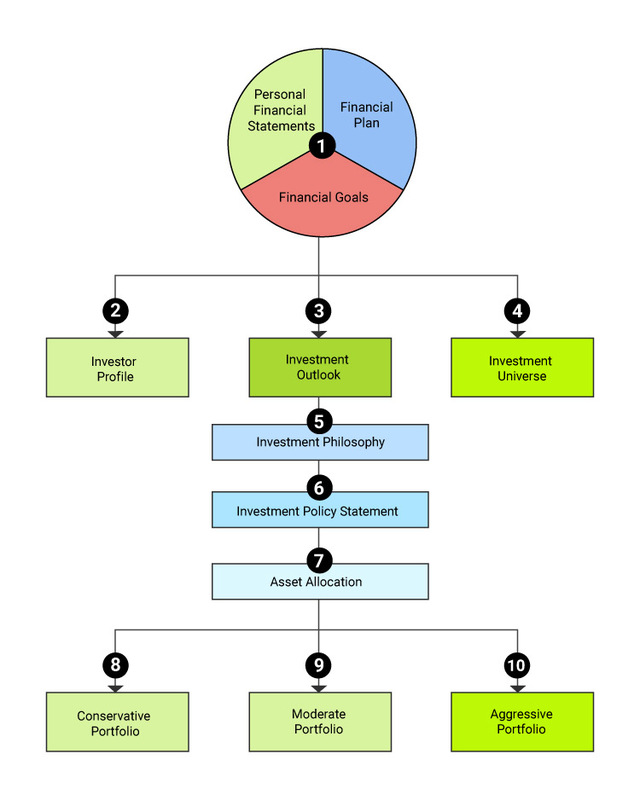 Step 7: The former 6 steps helps the Portfolio Manager in choosing the best Asset Allocation strategy for the client. Assets are allocated based on your risk-return profile among safe investment classes. Diversification is used to maximize return objectives and ensure capital preservation by minimizing risk. The Client’s objectives and needs are reviewed on an annual basis and should any change occur in the Client’s financial or personal situation during the interim period.